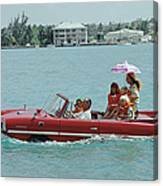 Sea Drive by Slim Aarons - 12.000" x 8.125"
Sea Drive art print by Slim Aarons. Our prints are produced on acid-free papers using archival inks to guarantee that they last a lifetime without fading or loss of color. All art prints include a 1" white border around the image to allow for future framing and matting, if desired. 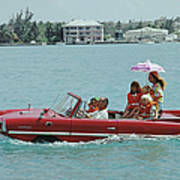 There are no comments for Sea Drive. Click here to post the first comment. 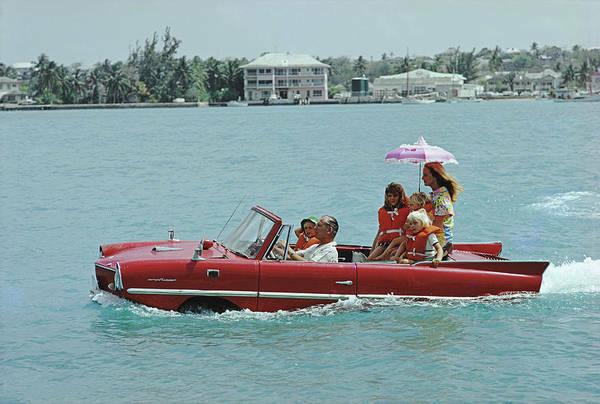 Film producer Kevin McClory takes his wife Bobo Sigrist and their family for a drive in an 'Amphicar' across the harbour at Nassau. The children are Bianca Juarez (Bobo's daughter from another relationship) and Siobhan, Branwell and Saoirse McClory. 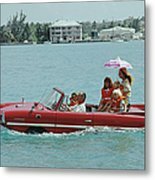 Original Publication: A Wonderful Time - Slim Aarons (Photo by Slim Aarons/Getty Images)Image provided by Getty Images.